The color of your bedroom could be impacting your ability to get a good night’s rest. This rich indigo scheme neutralizes stress and provides a sanctimonious space for sleep. Imagine your favorite color. Classic, reliable, and looks great on you. By some kind of metaphysical magicalness, this inanimate projection of light makes you feel something. It can’t explain it- but it quiets the storm, inspires the artist, and invites introspection. Like a Netflix original series or the air we breathe, we can’t get enough of it- but why? What gives color such a powerful influence? The answer exists somewhere between science and socialization in a area of study called color psychology. Color is a fundamental element in life. It can alter an individual’s mood, behavior, even their appetite. Although some studies suggest that color interpretation is based on ‘pseudo-scientific assertions’ rather than scientific data, color psychology is the study of how the way we experience color has long been a valuable facet of the human experience. Taking into consideration the healthy lifestyle of the residents, Sarah opted for a coniferous green as a symbolic tribute. 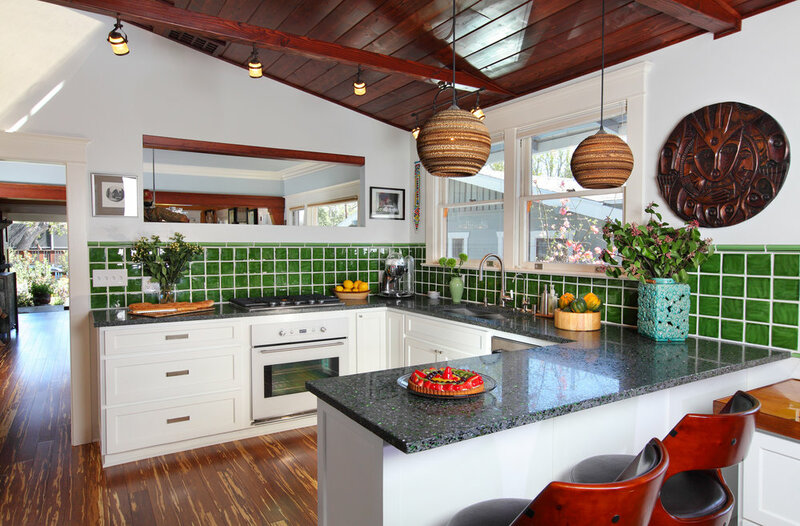 Green is a great shade to liven up a space with a natural look. Color psychology is the study of how color impacts mood and behavior. When studying color’s affect on mood, a color’s hue, saturation, and brightness must all be accounted for. Color perception can be affected by a series of factors, and the same color may appear different to various people. Intro to color psychology’s kid brother: Color Theory. While there are multiple definitions of Color Theory, there is a basic knowledge that helps define the essence of it. Color Theory is not only the series of hues known as the color wheel, it is a valuable structure of guidance to mixing color, and the visual emotions it invokes. The color wheel is composed of primary, secondary and tertiary colors. Primary colors are red, yellow, and blue. These three pigments remain solid on the color wheel, as they cannot be formed by the combination of any other colors. Primary colors are the true originators- hues from which all other colors are derived from. Secondary colors are formed when mixing primary colors; resulting with green, orange, and purple. Tertiary colors are formed by mixing a primary and a secondary color, creating yellow-orange, red-orange, red-violet, blue-violet, blue-green, and yellow-green. Colors can be categorized into three hue variant descriptors; cool, warm and neutral. 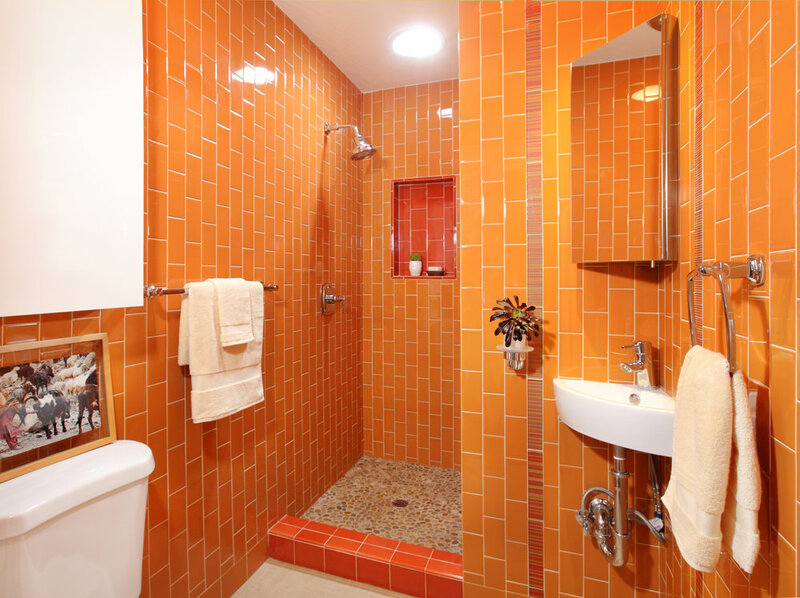 It’s easy to feel energized in this West Hollywood bungalow bathroom covered head-to-toe in orange tiles. This cheerful and vibrant secondary color combines the energy of red and the happiness of yellow. By mixing colors and exploring different color combinations, one can reap the benefits of different colors’ impacts by carefully integrating them together into a singular space. Personal possessions, plants, and even food can provide additional color. Grouping the dragon fruit and star fruit together brings two distinct pops of red and yellow. In a personalized Santa Monica family home, each room embodies it’s own personality and individual. This can be attributed to the diverse use of color. Home to 3 children, each impassioned youth expressed themselves by participating in the selection of colors in their room. In one room; a rustic orange courts a creative, comfy atmosphere. While in the other, a softened lavender beckons a certain subtle sophistication blended with an imaginative air. Sarah Barnard uses the ocean as a focal point of this Ocean Avenue penthouse living room by utilizing a beautiful neutral color scheme that prevents the eye from becoming too distracted or strained. In 1666 Sir Isaac Newton discovered when pure white light is inserted through a prism; it separates into the visible color spectrum. However, our understanding of color’s unique mood enhancement and health benefits extend far beyond this point in history. Ancient cultures around the world embraced the power of color and practiced chromotherapy. Chromotherapy is often referred to as ‘light therapy’ which employed colors to heal various ailments, and is still currently used as a holistic or alternative method. This treatment uses the color red to stimulate the mind and body, and increase circulation. Yellow to stimulate the nerves and purify the body. Orange heals the lungs and increase energy levels. Blue is believed to soothe or treat any illnesses or pain, while indigo shades are used to treat skin problems. Regardless of the scientific validity of the practice of chromotherapy, color is an indisputably important feature in our visual environment and can create sanctuary in which we manifest healing. There are color interpretations that have a common meaning. For example; traffic lights—green means go, yellow indicates a yield, and red most recognizably signals a stop. However, most color perceptions tends to be subjective and contingent on application. A red room might make some feel anxious, while blue walls can induce a sense of calmness or relaxation. There are various reasons why a person might react a certain way towards a color, an explanation can be the location or amount of color used, even the culture someone comes from, or their personal experiences. As in all things, there exists a duality to every color archetype. While bold hues of red have given some evidence to have negative effects in cognitive ability in children and adults, there is also evidence to show it can increase appetite, enhance athletic performance, and spark feelings of excitement and arousal. While a red bedroom may inhibit sleep, a red locker room can rally a team for competition. Due to this variation in interpretation, many psychologists express skepticism of the validity of color theory’s effect on an individual. In truth, this variation exemplifies the way the usage of color can be just as impactful as the color itself. Complimenting the fluidity of Color Theory, this allowance grants validity to each of our experiences that have helped inform our perception of color. The color blue is very versatile in that, while it can be used as a calming element, it can also symbolize energetic forces like the ocean or provide a masculine touch depending on its tones. 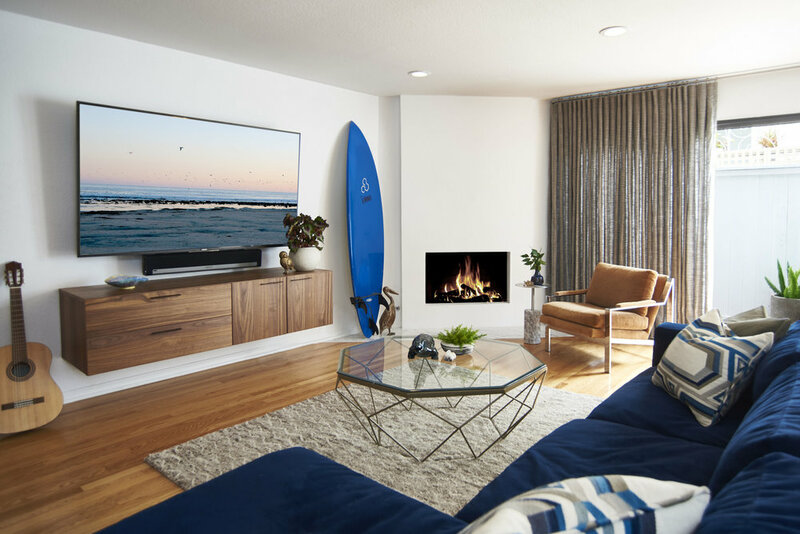 By juxtaposing projects like the custom-built bedrooms of this California family residence with the masculine Santa Monica townhouse, we can see the breadth of emotion just one shade can bring forth. Both utilize a similar palette; a combination of rich blues and natural greens against natural wood and white backdrops. Despite their similarities in color, both spaces pique very different energies. A blue surf board emanates the raw excitement of the open ocean, while blue bunk beds manifest a dreamy, youthful coziness reminiscent of pillow forts and camping in the backyard. The blue tones used are similar in hue and saturation, yet they inspire very different moods due to the way they are utilized. In this boy’s room in the California family residence, Sarah utilizes the duality of the color blue to create a space that encourages both play and relaxation. See you in dreamland! Appropriate color selection is crucial in our everyday lives. Color can be overwhelming or healing, so it is important to understand how color can affect the dynamics of a room and the people in it. Interior designers deeply believe that color can drastically alter moods, feelings, and emotions. 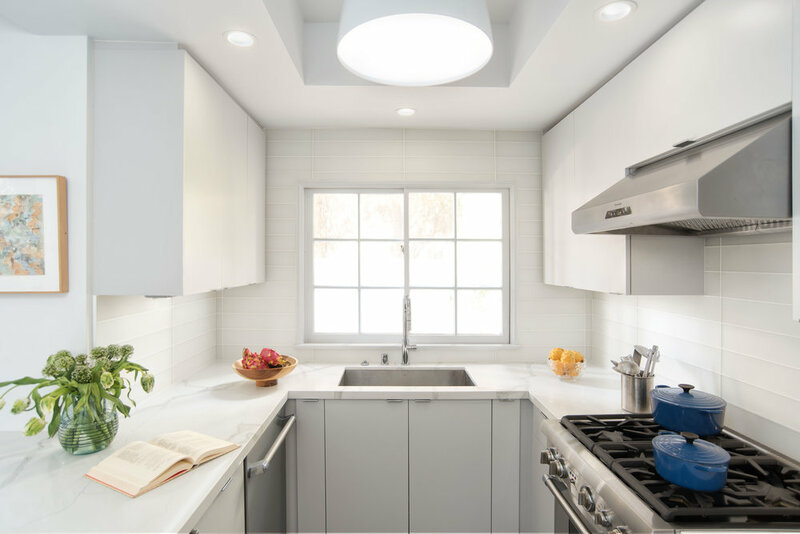 Before designing your space or switching up your color scheme, pay close attention to the way your mind and body feel when you experience different colors and consult with your designer. Regardless of age, it has been examined that both adults and children are affected by color in a multitude of ways. While color interpretation can vary between cultures and people, we are unified in the power of color- the magical and visceral ways it influences us as we move through our day. It can provoke us to be more active or optimistic, or it can be the visual lullaby we need to rest peacefully at night. Positive and thoughtful applications of Color Theory have many benefits; inspiring us to play, grow, and find peace.